Where the cake magic begins! If its difficult for you to visit our shop in Bishops Stortford for a cake tasting and a face to face chat then our cake tasting sample pack is the perfect solution. 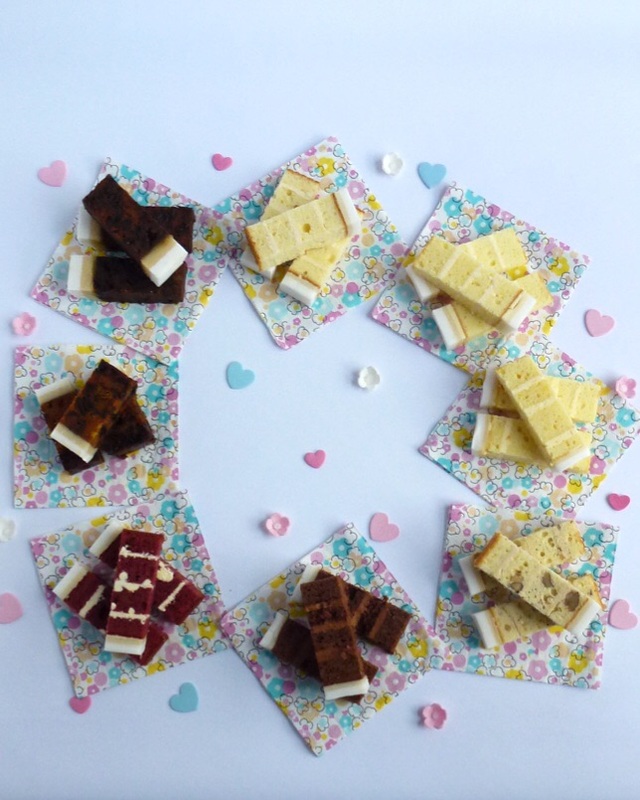 Each pack contains all of our delicious wedding cake recipes, Butter vanilla, Lemon Twist! Orange Grandeur! Coffee and Walnut, Belgian Chocolate, Red Velvet and White Chocolate, Traditional Rich Fruit Cake and Luxurious Wedding Fruit for iced cakes. For semi-naked and buttercreamed cakes Butter vanilla, Lemon Twist! Orange Grandeur! Coffee and Walnut, Belgian Chocolate, Red Velvet and White Chocolate and Victoria sandwich. This allows you to decide your favourite in the comfort of your own home and if you order a wedding cake from us the cost of this pack will be refunded. Could you please include the date of your wedding in the box on the right. Your order can be placed on-line or over the phone which ever suits you best. A light, soft textured all butter vanilla Genoese cake, layered with fresh vanilla butter cream which is then covered with a thin layer of white almond paste and soft iced or royal iced. As the vanilla cake but with the added twist of fresh lemon juice and zest in the cake and a shot of Limoncello in the buttercream. As the vanilla cake but with an additional helping of freshly squeezed orange juice and grated zest in the cake together with a hit of Grand Mariner in the buttercream. As the Vanilla cake with finely chopped walnuts and coffee flavoured buttercream. Melt in the mouth rich Belgian chocolate cake, layered with fresh Belgian chocolate buttercream which is then covered with a thin layer of white almond paste and soft or royal iced. Please note this cake can be gluten/wheat free but please tick the gluten/wheat free box when ordering. As our special Belgian Chocolate cake recipe but we also make sure there is no cross contamination from gluten or wheat. A modern classic, red cake with a velvety texture and a delicate chocolate flavour with layers of white Belgian chocolate butter cream. The cake is then covered with a thin layer of marzipan and soft or royal iced. A very moreish and moist cake layered with fresh vanilla buttercream and a recipe that everyone will enjoy. This recipe is not suitable for iced cakes. Made to a secret family recipe using careful selected quality ingredients, slowly baked resulting in a finished cake that is golden and moist, it is then left to mature before being covered with almond paste and covered with soft or royal icing. This is a time honoured secret family recipe which is packed with dried fruit, dark molasses sugar and chopped cherries and almonds, its baked long and slow resulting in a dark, sumptuous fruity cake. It is then 4x fed with brandy over 28 days and left to mature for minimum of a further 2 months before bring covered with white almond paste and soft or royal icing ready for your special day.